Manchester United manager Jose Mourinho has praised his defenders for their improved performances after three consecutive wins in all competitions. The Red Devils secured back-to-back Premier League wins against Burnley and Watford before beating Young Boys 3-0 in their Champions League group stage opener on Wednesday. After losing two of their opening three games of the season, United have bounced back quickly and will now look forward to a clash with newly promoted Wolves at Old Trafford on Saturday. 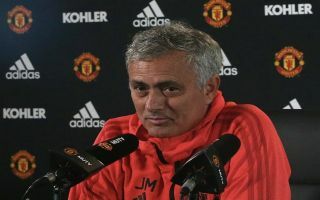 Mourinho stressed the importance of signing a new centre-back in the summer, but the club failed to land any of its transfer targets in that position, which left the team having to make do with its current crop of defenders, including Chris Smalling, Phil Jones, Victor Lindelof and Eric Bailly. Despite their stuttering start to the new campaign, in recent weeks United have looked more solid at the back, which the Portuguese boss was happy to highlight during his press conference on Friday, as according to Sky Sports, he told reporters: “The team as a team is resolving the defensive problems better than before, I don’t want to say it was Eric Bailly or Phil Jones and now Smalling and Lindelof. Wolves have surprised everyone in the opening month of the season, with two wins, two draws and just one defeat so far, as Nuno Espirito Santos has guided his team into a comfortable mid-table position. United supporters will be expecting another win this weekend but Mourinho’s men cannot afford to take anything for granted against the Premier League new boys, who have looked right at home in the top division so far.